Musings from Beyond the Clouds » 12 Days 2009, #1: Fuzakenna! Toradora! was one of the highlights of the beginning of 2009 (and the end of 2008). It’s been featured in numerous end-of-the-year countdowns (all of which I’m too lazy to find and link) as one of the strongest shows of the year. It’s the only series to be mentioned twice on my own list of twelve moments. And (naturally, considering its place at #1) it’s one of my personal favorites. This was weird, but pretty cool. 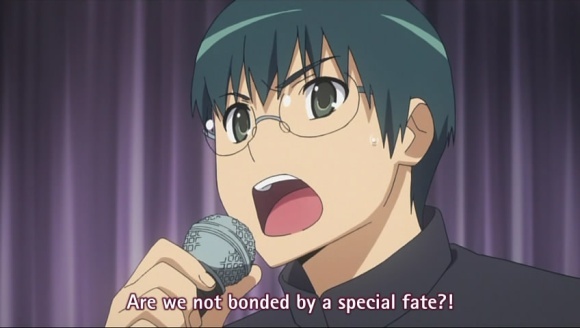 Sure, Toradora! could have been an ordinary series. Good or bad, it’s still basically a high school romantic comedy. Like many others, it might have been boring, full of cheap gags, flat characters, and uninteresting relationships; what made it into one of the favorite shows of the year? 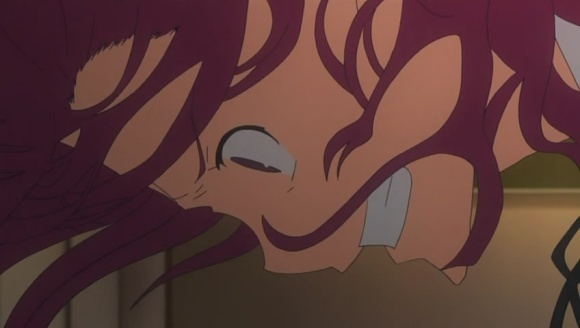 The plot is typical of the genre and the animation is neither crippling nor spectacular. In many ways, it is an ordinary series. Even the characters have simple and conventional backgrounds; Taiga is a Kugimiya Rie tsundere, Minorin a genki girl, Ami a princess, and Kitamura a typical male sidekick. Ryuuji is perhaps the most interesting character from the start, with a face like a yakuza and the homemaking skills of the best stay-at-home mothers. 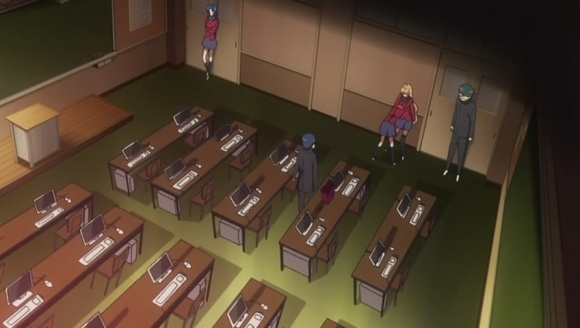 But where any other series would leave those characters within their preset roles, Toradora! smashes their molds and lets them grow to be so much more. 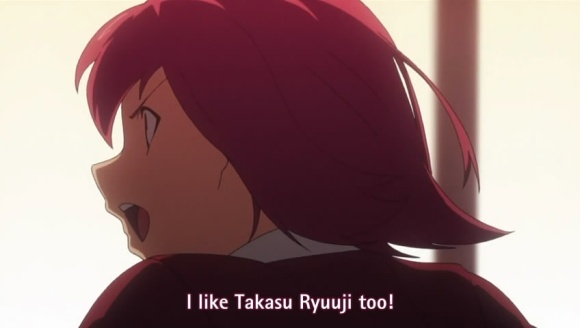 Taiga is clumsy, insecure, and embarassed by her crush on Kitamura (and she eventually stops calling Ryuuji a dog). 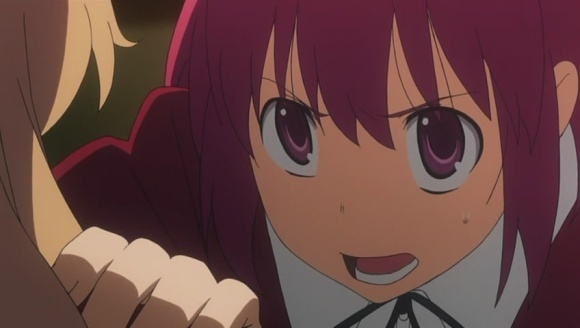 Minorin stays energetic to conquer her own fears and works multiple jobs to save toward enrolling in a sports university. Ami drops her mask and transforms into something of an honest observer, frustrated with the other relationships’ lack of progress and (increasingly) pushing the others toward making decisions. Kitamura falls in love with the student council president, goes through a teenage rebellion, and somehow remains a lovable idiot (and a bit of an exhibitionist). 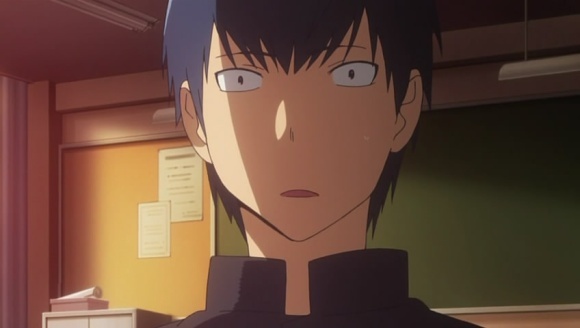 And Ryuuji overcomes his complex toward his father and realizes his feelings for Taiga. 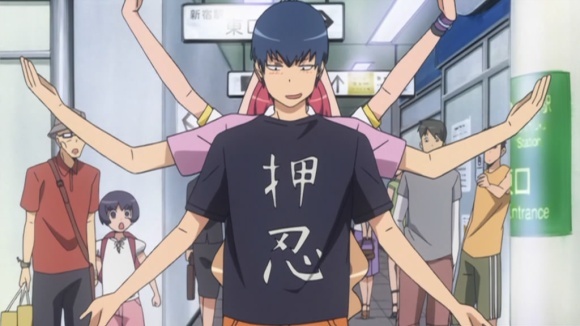 Toradora!‘s characters are extraordinarily human, with their own flaws and desires. They’re all insecure in one way or another; Taiga over her feelings for Kitamura, Ami over her stalker, Minori as she struggles to move forward, Kitamura over his love for Kanou (the student council president), and Ryuuji because of his feelings for Minorin. They struggle with their own feelings and dreams, trying to cope with a confusing part of their lives. They succeed and fail. And through it all, they contemplate themselves and each other, on love and life, in a way that makes viewers feel intimately connected to them. 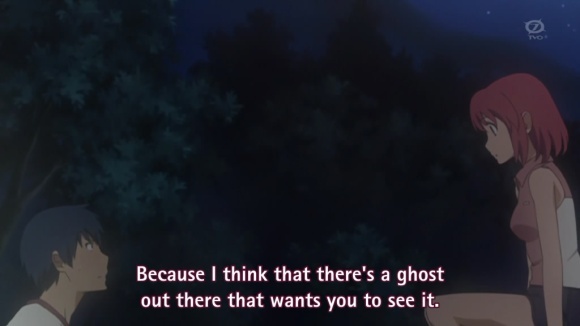 From Minorin’s speech about ghosts, UFO’s, and love and Ami’s talk about equality to Kanou’s speech of inspiration to Kitamura, Toradora!‘s characters show a depth greater than almost every other series. And the characters display incredible intensity, determination, and passion. 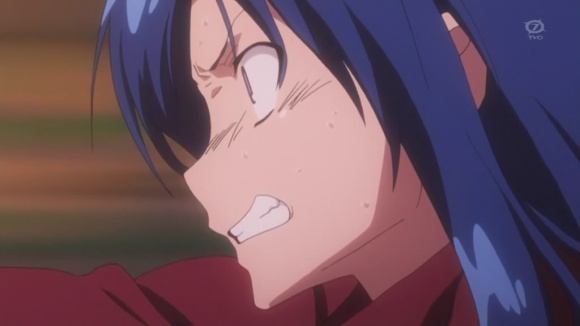 I wrote yesterday that ef – a tale of memories has some of the most passionate moments in recent memory, but so many scenes in Toradora! are even more passionate. the list goes on. But all are overshadowed by the end of episode 23, where all five major characters are… well, awesome. My happiness can only be made with my own hands! My happiness doesn't depend on anyone but me! It is, without a doubt, the emotional peak of the series, and the writing and acting are superb, and it’s one of my favorite scenes from any series. All of the emotions and frustrations that had been building in the characters are finally released, leading to a satisfying catharsis. 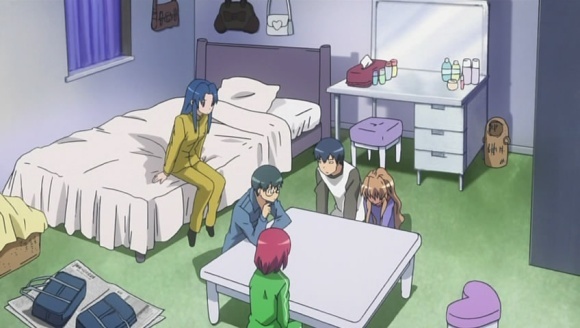 But beyond the enormous emotional impact it has, I feel this scene highlights the other great strength of Toradora!‘s characters—their willingness, even obligation, to help one another. 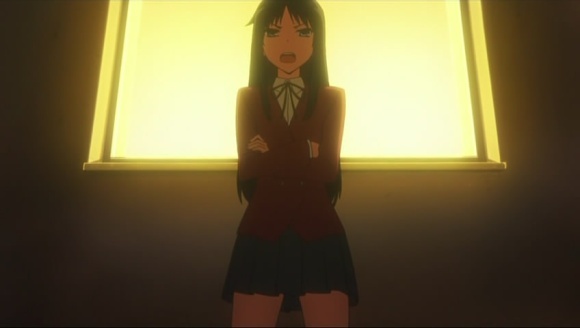 Throughout the entire series, the main characters can’t leave one another alone and unhappy. Taiga and Ryuuji become friends because of Ryuuji’s willingness to give her advice about love, and they help Ami break her mask and reveal her true self. Taiga fights Kanou to stand up for Kitamura’s feelings, and Minori and Ryuuji run with everything they have to win the “Mr. Lucky Guy” race and comfort Taiga. Ami tries to motivate Minorin to accept Ryuuji’s feelings, and Taiga runs for Student Council President to bring Kitamura out of his funk. At the end of the series, Ami, Kitamura, and Minori offer their support to Taiga and Ryuuji when they plan to run away, even over their own reservations and disapproval. Moreover, they’re all willing to make sacrifices—large sacrifices—for one another’s happiness. 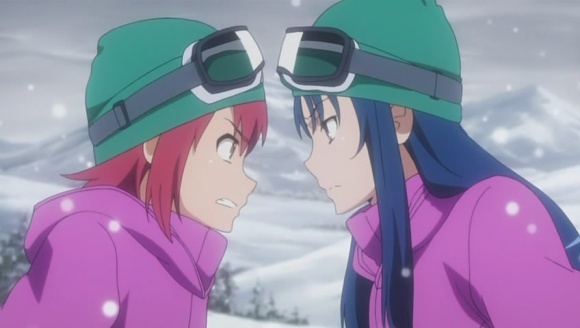 Ami and Minori both like Ryuuji, but they both support, even force, Taiga and Ryuuji to be a couple. 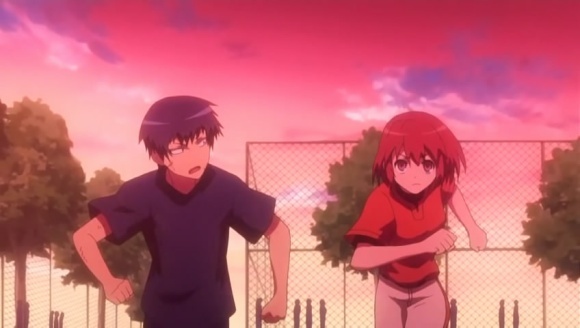 Ryuuji risks his friendship with Minori to encourage Taiga to reunite with her father. 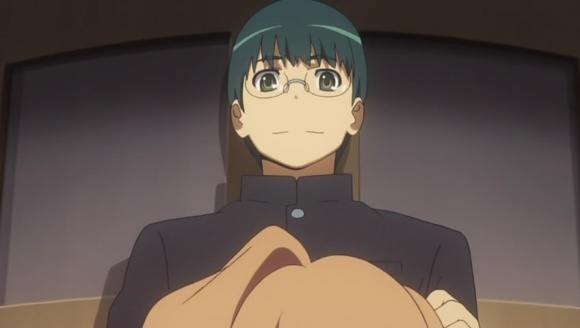 Kitamura overcomes his rejection by Taiga and supports her relationship with Ryuuji. 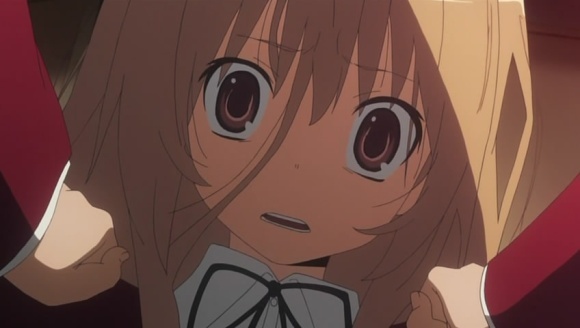 And ultimately, even Taiga chooses to defer her happiness by moving away from Ryuuji. 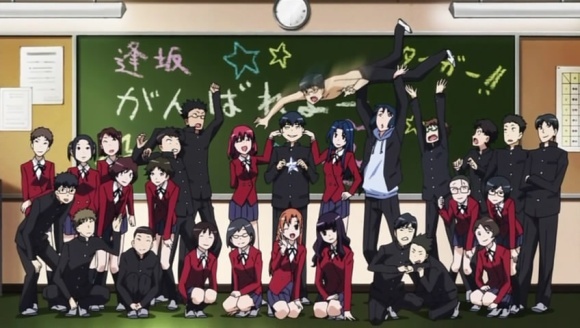 Maybe it’s this maturity that sets the characters of Toradora! apart from those in other series. Most of the time, characters in school dramas blindly charge forward, climbing straight over every obstacle in their path; even in Clannad, while Tomoya overcomes incredible loss, we don’t see him show the kind of self-restraint displayed by Ami, Minori, Taiga, Ryuuji, and Yuusaku. 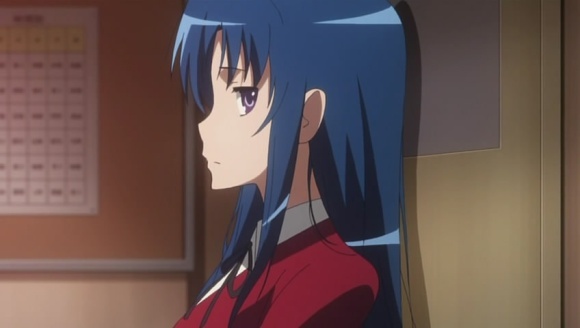 Perhaps that’s the real meaning behind Toradora!‘s ending, and Ryuuji’s year without seeing Taiga; perhaps they are mature enough to recognize when to wait. 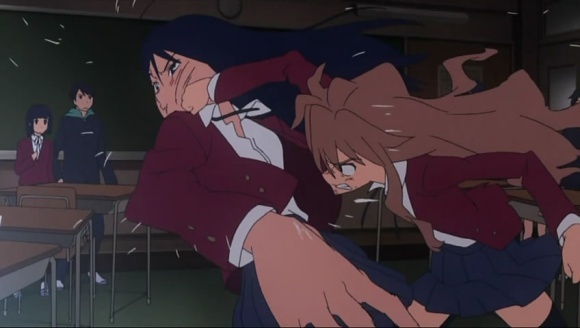 But for certain, it’s why I love Toradora!, and why this is the first—and last—of my Twelve Moments in Anime 2009. Here's to hoping you dream of a hawk, and eggplant, and Mt. Fuji. Have a happy new year!